In Duluth entstand die einzige Schwebefähre der USA. Als 1871 in Minnesota der Duluth Ship Canal für ozeangängige Schiffe gebaut wurde, hatten die Bürger von Duluth ein Problem: Sie waren abgeschnitten vom so genannten "Park Point" am gegenüberliegenden Ufer des Lake Superior. Nachdem die Hafeneinfahrt lange Zeit im Sommer mit klassischen Fährschiffen und im Winter, wenn der Hafen zugefroren war, mit provisorischen Stegen überbrückt worden war, wuchs mit zunehmendem Verkehr der Wunsch nach einer zukunftsträchtigen Lösung. Schliesslich wurde 1905 eine Schwebefähre nach dem Muster des "transbordeur" in Rouen gebaut, einmalig in den USA. Die hin und her pendelnde Gondel wurde zwanzig Jahre später durch ein auf und ab fahrendes Strassenstück ersetzt. Aus der aerial transfer bridge wurde eine aerial lift bridge. Brückenzoll war nie erhoben worden. Das blieb auch so, nachdem die neue Brücke 1930 in Betrieb genommen war. Das Bauwerk, das der Stadt gehört, wurde 1973 in das National Register of Historic Places aufgenommen. Die Bürger von Duluth lieben ihre Brücke, nutzen sie als Skater-Strecke und feiern sie mit Tanz-Performances. In einem Lokalblatt erschien eine Liebeserklärung an die Fähre. Der Schriftsteller Barton Sutter findet sie "wonderfully old-fashioned, graceful, light and airy", der College-Professor Tom Morgan sieht darin "unser Symbol für Gastfreundschaft". Bürgermeister Gary Doty hält die Brücke für "einen Teil unserer Identität". Die Denkmalschützerin Britta Bloomberg erzählt: "Die Leute sind faziniert von der Ingenieurkunst, der Technologie und der langen Lebensdauer." Die Stadt erklärte das Jahr 2005 - anläßlich des 100jährigen Bestehens - zum "Jahr der Brücke" und feiert das Bauwerk mit einem "summer of parties" (siehe unten). Lift bridges are nothing special -- the United States has dozens of them. So why are people so captivated by Duluth's beloved Aerial Lift Bridge? Lift bridges in the U.S. are like gulls in Canal Park. OK, maybe not that common. But there are dozens of them in North America, perhaps as many as 100, historian and retired professor Jerry Sandvick said. The Park Point resident spent the past two years digging into the history of Duluth's famous Aerial Lift Bridge. "There are a couple in Chicago. There's that one in Stillwater (Minn.). There are several in Louisiana. And the one in Houghton, Mich.," he said. "They're not the usual type of bridge, but they're not rare. "Some people think this lift bridge in Duluth is unique," he said. "It's really not." If the Duluth Aerial Lift Bridge isn't unique, then what makes it so special the mayor declared this the year of the bridge? Duluthians are planning a summer of parties to celebrate the structure's 100th birthday. Is it the romance of the bridge when it's all lit up at night? The way the towering crisscross of girders and bolts connects us to the world via Lake Superior and the St. Lawrence Seaway? How about, when we're near the bridge, we're so close to boats the size of department stores we can almost reach out and touch them? Yes, yes and yes, agree Sandvick and others. But they suspect the bridge's past may have even more to do with it being one of Minnesota's best-recognized and most-photographed landmarks. 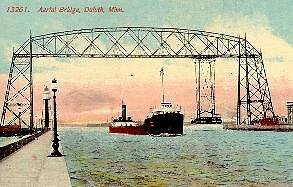 When it was built in 1905, Duluth's then-Aerial Ferry Bridge featured a gondola car that hung from the overhead span and slid across the canal several yards above the water. The 186-foot-tall structure was the first of its kind in the United States and one of only five in the world. 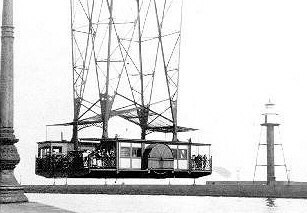 Only about nine "transporter bridges" are believed to be in existence today. None are in the U.S. Another 12 or so have been destroyed, demolished, remodeled or otherwise lost. "Duluth's 1905 bridge was special," said Thom Holden, director of the U.S. Army Corps of Engineers' Lake Superior Maritime Visitors Center in Canal Park. "That bridge was a simple, but durable, design," he said. 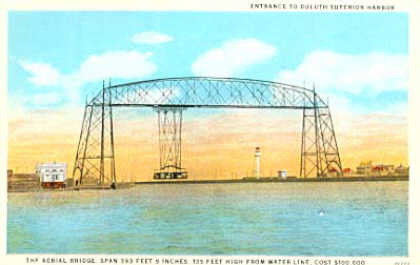 "The connection, or reconnection, of Minnesota Point with Duluth was important. And the amazing thing was the work on the bridge was accomplished with no interruption to shipping." 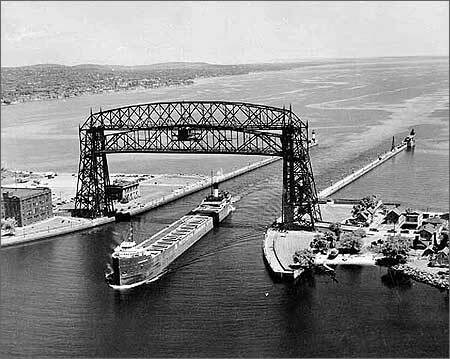 Duluth's original aerial bridge was constructed 34 years after the Duluth Ship Canal was dug through Minnesota Point. Before the bridge, rowboats and ferries carried people and goods from the mainland to the point. For a short time, a rope-and-plank footbridge spanned the canal. It swayed so much in the wind and was so unsteady, only the bravest -- or dumbest -- dared to use it, historians said. City officials accepted bids for a $100,000 project, about $2 million today, in 1901. City architect Thomas F. McGilvray was credited with the basic design. Minneapolis engineer Claude "C.A.P." Turner, a former Duluth resident, received the final patent. Footings were poured in September 1901. Modern Steel Structural Co. of Waukesha, Wis., erected the bridge with 700 tons of steel and 100,000 rivets. It went into service March 27, 1905. 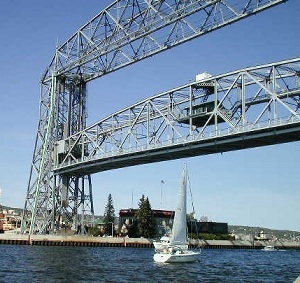 The Duluth bridge was modeled after a transporter bridge in Rouen, France, Sandvick said. That bridge was destroyed by fire June 9, 1940, during the fall of France during World War II, he said. With the German army pouring in from the north, retreating French troops blew the bridge in a failed attempt to slow the enemy. Sandvick taught history at the University of Minnesota and at North Hennepin Community College in Brooklyn Park, Minn. He retired to Duluth three years ago. His research on the Aerial Lift Bridge is expected to be published in two parts this summer in the Maritime Visitors Center's Nor'Easter magazine. Duluth's Aerial Ferry Bridge grew impractical with the rising popularity of the automobile and increasing demand for roadways. In 1930, a 10-month, $400,000 project -- more than $4.6 million today -- replaced the gondola with today's rising road deck. 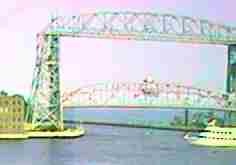 Perhaps the most famous transporter bridge still in existence has ties to Duluth, Sandvick said. The Newport Bridge in South Wales was designed in 1893 by Ferdinand Arnodin -- five years before he designed the bridge in Rouen, France, Duluth's model. The Newport Bridge uses cables to hold its gondola car. Duluth's bridge was a "stiff traveler," Sandvick said, with girders holding the car. Strong winds off Lake Superior were believed too hazardous for cables. ï¿½ Middlesbrough, UK. The British structure is "the best known landmark in Teesside," according to a Web site maintained by the BBC. The bridge's "cradle" can carry 200 people or six cars and a minibus. "Its famous shape is visible from miles around Middlesbrough," according to the BBC. ï¿½ Warrington, Cheshire, England. Built in 1916, the now-out-of-service bridge crosses the Mersey River. ï¿½ Rochefort, France. The 1900 Rochefort-Martrou bridge crosses the Charente River. ï¿½ Osten, Lower Saxony, Germany. Built in 1909, the bridge spans the Oste River. ï¿½ Rendsburg, Germany. Built in 1911 over the North and Baltic Sea Canal, the bridge has a capacity of six cars per crossing. ï¿½ Vizcaya, Spain, near Bilbao. The Portugalete Transporter Bridge was built in 1893 over the Nervion River. ï¿½ Buenos Aires, Argentina. The 1914 Boca Bridge unites Buenos Aires City, the capital of Argentina, and the Province of Buenos Aires. ï¿½ London, England. The Royal Victoria Dock Pedestrian Bridge opened in 1998, featuring both a footbridge and a boom-like central section to carry pedestrians. En Estados unidos se llegó a construir un único puente transbordador siendo la ubicación del mismo la localidad de Duluth, en Minnesota. Su primer viaje lo realizo en 1905, siendo sus caracteristicas tecnicas los 121 metros de luz, por una altura de pilares de 57 metros. En 1930 es sustituido por un puente levadizo denominado aereo. Del primer puente se aprovecharon las torres, el resto pertenece al nuevo sistema. In the United States of America only one bridge was built, in Duluth, Minnesota. Its first trip was made in 1905, and its characteristics were: 121 metres span, supported by towers of 57 metres. In 1930 it was substituted by an elevated aerial bridge. The towers of the original bridge were used to support the new System. Alfredo Pérez Trimino: "Puente Vizcaya - mi vida en imágines", Bilbao, 2000.